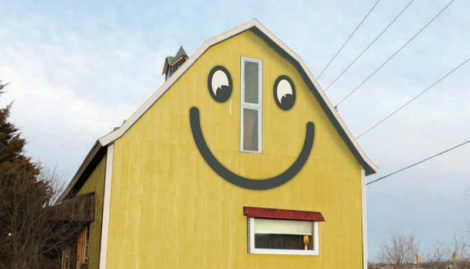 As you head west out of Milwaukee, Wisconsin on Interstate 94, there was this fabulous old, yellow barn with a huge smiley face. It was a landmark that people recognized, used for directions and meetings and a general feel-good for your day when you passed it. The smiley face came down when new owners acquired the building and renamed it Montage, selling Amish furniture. Sixteen years pass, and the owner of Montage wants to sell and retire. Onto the scene enters Maria Luther, a business owner with a new vision for the building – a candy and toy store – and plans are made to resurrect the Smiley Face and return it to its historical grandeur. Maria enlisted our help to make the sign and help with the permitting process. The city of Delafield planning commission had to approve the plan. Maria wisely started a Facebook page to alert area residents to her plan, solicited media coverage and interest grew. The Smiley Face sign was approved by the planning commission. Final drawings were approved and the sign went into pre-production. We will let you follow along as the sign is cut out on our CNC router, as it is painted and notably when it is loaded on our trucks and installed in its new home. The Smiley Barn will return!